Unique selling point. Acer seems to have understood the times and went for a matte Full HD IPS panel for the new variant of their Aspire V3-571G. Add the brand new Nvidia GeForce GT 730M, a potent dual-core processor and 8 GB of RAM to that, and you've got a good line of components to pique a buyer's interest. Wondering how this update of the Aspire V3 turned out? You'll find out in this review. A Full HD display with a matte finish and IPS technology, along with a brand new Nvidia GeForce GT 730M GPU -- the updates are significant on Acer's multimedia fireball with the tongue-twisting name Aspire V3-571G-53238G1TMaii. Since this configuration is likely attractive to many of our readers, we consider all the substantial updates in this review. Of course we focus on the aforementioned display and put the new 730M through the "agony" of a series of benchmarks and current PC games. 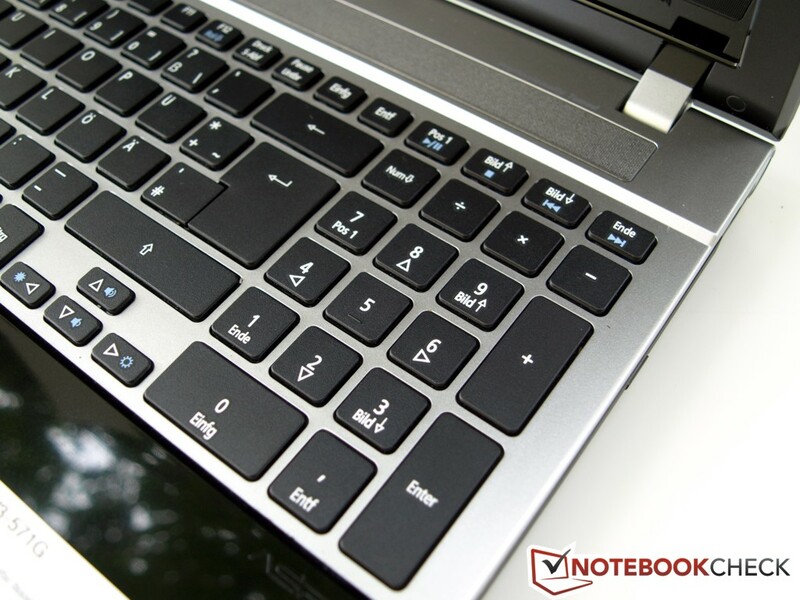 Because the device we are reviewing is an update of the Acer Aspire V3-571G-73614G50Makk we just reviewed, we are jumping right into the updates and direct you to the review of the predecessor for information about the case, connectivity and input devices. Acer seems to have finally heard the numerous customer complaints about reflective notebook displays, and though the majority of devices are still outfitted with glossy screens, this time Acer built their new Aspire V3-571G with a matte display with crisp FullHD resolution (1920x1080) and the viewing angle stabilizing IPS technology. All these changes combined make for an attractive and unique selling point in this price range. 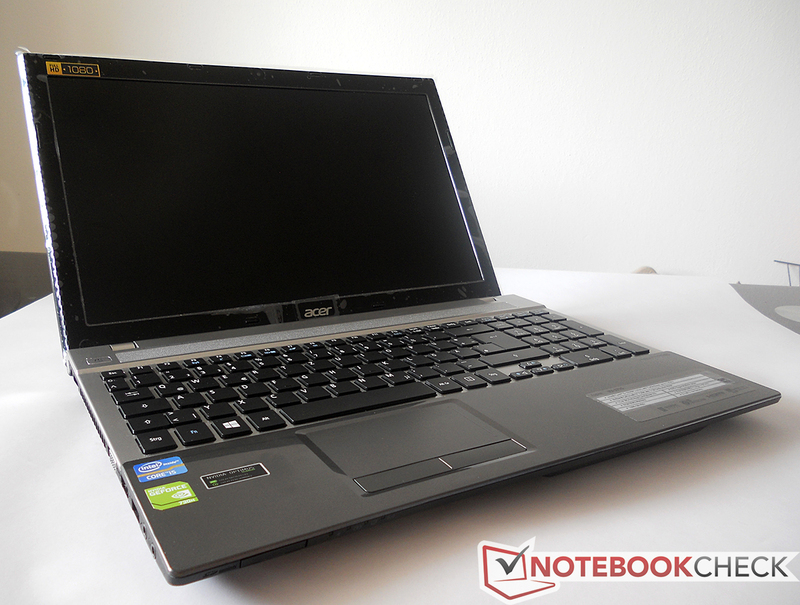 With this in view, the Acer Aspire V3-571G-53238G1TMaii can sprint ahead of many competitors in the multimedia market. 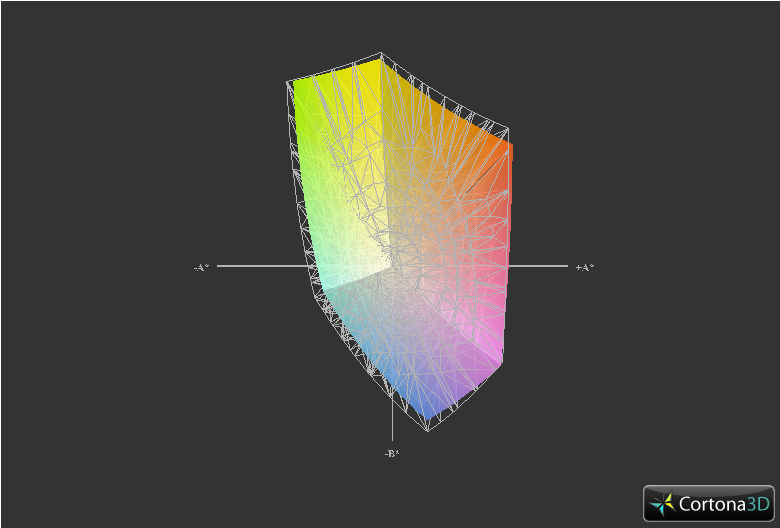 Taking a look at the measurements from the LG Philips panel shows off the display's good qualities: A good maximum brightness of 305 cd/m2 at a contrast of 1089:1 and a black value of 0.28 are outstanding values. 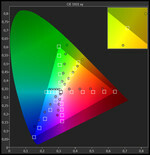 Observing the color-rich and high contrast display, there's no dispute that these excellent features are obvious to the naked eye. We also measured the display's color representation before calibration -- that is, in its state straight out of the factory. Here we generally observed slight, though in the blue component even conspicuous discrepancies in color accuracy, which are confirmed in the level of color saturation and theoretically result in visible color differences (DeltaE 2000 values). These results disqualify the LG Philips panel for a top position, but they are vastly superior to the results of weaker displays, ex. the XIRIOS S402. In regards to the color space the panel is able to display, we compared the Aspire V3-571G's panel on the one hand with its predecessor, the Aspire V3-571G-73614G50Makk, and on the other with the Full HD IPS panel on the Asus Zenbook UX51VZ. 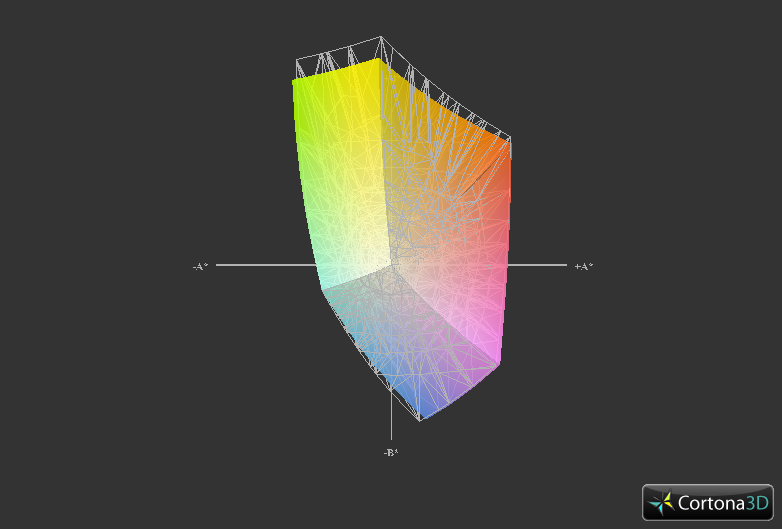 Here there is clear agreement in terms of color space coverage, though the more extensive sRGB color space is not fully covered. But this fact is bearable, seeing as sRGB or AdobeRGB color space coverage is only relevant for professional photo editing. 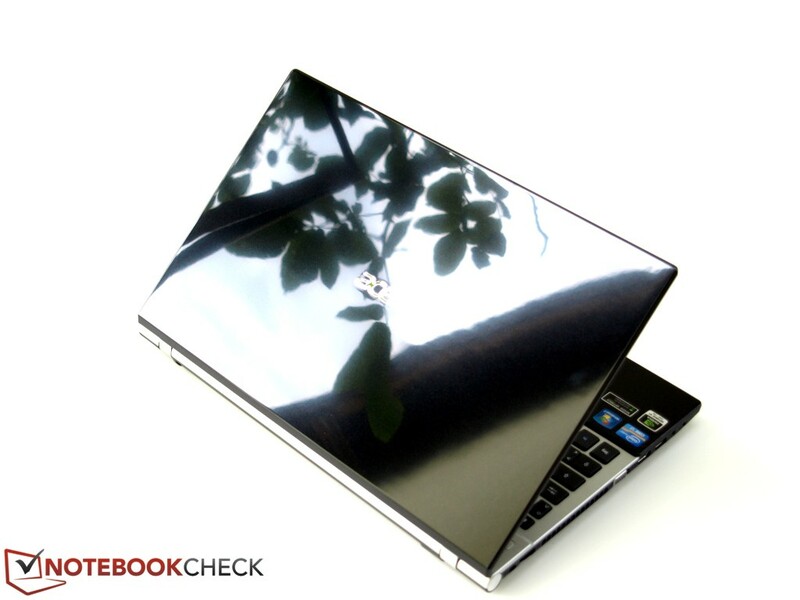 The most important considerations for a notebook's usefulness in an outdoor environment are of course the display brightness and screen coating. Acer does very well in both areas: The matte surface effectively prevents reflections at low viewing angles that aren't excessively high, and the good 300 cd/m2 (battery mode: 230 cd/m2) display brightness does the rest to render the Acer Aspire V3-571G-53238G1TMaii perfect for outdoor use. The topic of viewing angles doesn't cause the LG Philips panel any trepidation either: Using IPS technology (rather than the typical TN technology), the Aspire V3-571G makes the screen viewable even at sharp viewing angles, which, combined with the device's good image quality, allows for a great experience at a movie night with friends. 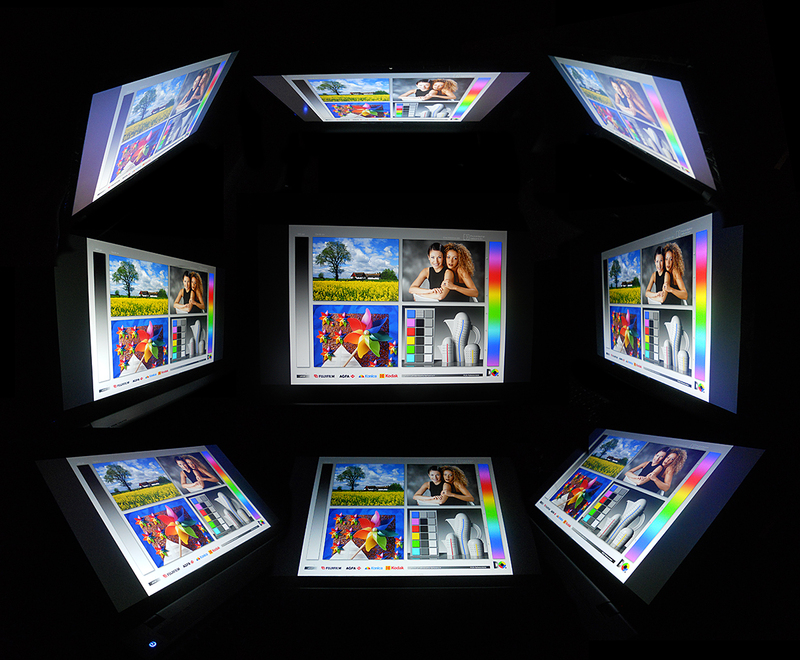 No matter whether you're looking at the screen from above or below, from the side or at a diagonal, the panel doesn't reveal any weaknesses -- even from sharp viewing angles the display shows a color-true picture. The vertical axis is especially prone to color inversions even on high-end TN displays, but with the IPS panel that's a thing of the past. 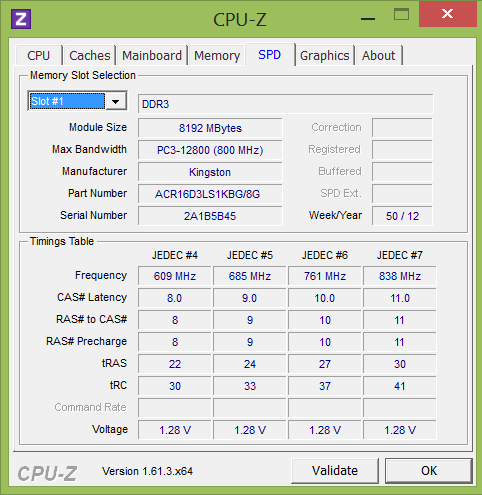 The second topic of interest in our review of the updated Acer Aspire V3-571G-53238G1TMaii is its hardware and the resulting system performance. Of course we dedicate this segment mainly to the new Nvidia GeForce GT 730M, one of the first representatives from the new 700 line from the graphics card manufacturer. We put the card through a series of benchmarks and of course tested it in the hot "fire" of a ton of games. Standing beside the Nvidia GPU is a potent i5-3230M dual-core processor from Intel and 8 GB DDR3 memory from Kingston. 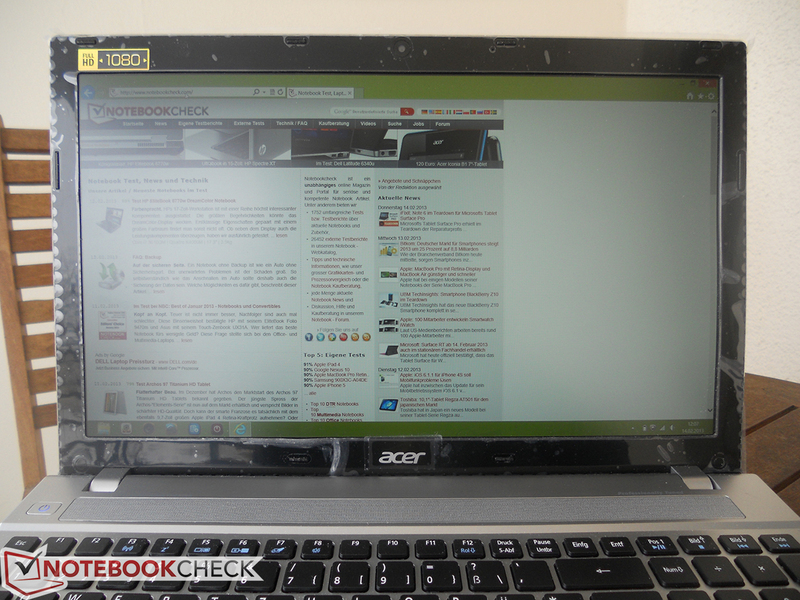 The new Acer Aspire V3-571G-53238G1TMaii employs an Intel Core i5-3230M CPU with a clocking frequency of 2.6 GHz as its central computing unit. 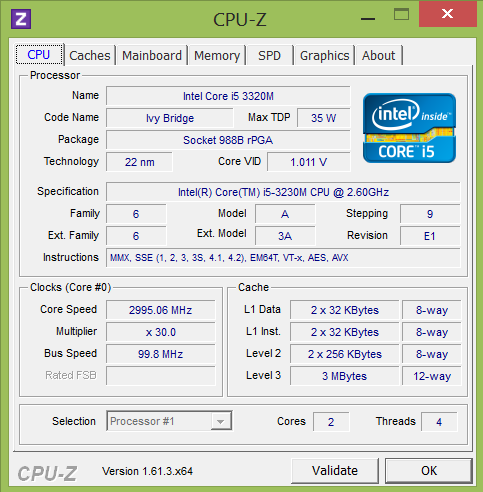 The dual-core processor stemming from the (still) current Ivy Bridge generation can clock up to a frequency of 3.2 GHz using Intel's Turbo Boost, to the extent that the operating and hardware temperatures permit. 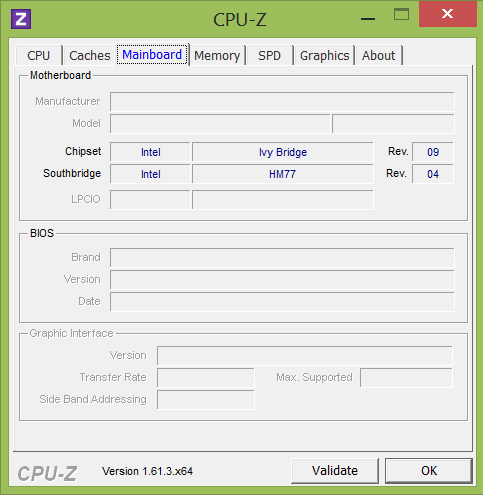 Alongside the Nvidia GPU, the computer also possesses the usual Intel HD Graphics 4000 for simpler graphics tasks, which via Optimus is automatically chosen for low computing loads. In the render benchmark Cinebench from the 3D specialist Maxon we measured the performance of the Ivy Bridge CPU, which achieved the highest results in our database for this infrequently used model. In comparison to the more common i5-3210M, the results from the i5-3230M lie at the same level and sometimes in the little brother's top bracket. 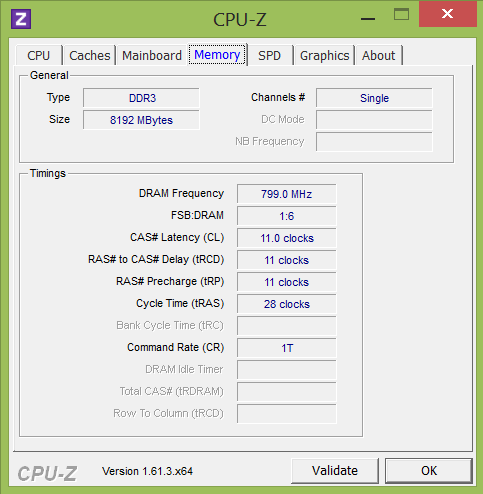 The computing unit doesn't quite reach its maximum Turbo Boost of 3.2 GHz, but with a constant 3 GHz it computes substantially above its base clock, though the processor is blocked off at the standard 2.6 GHz (~86% performance) in battery mode. As always, we used the widely employed benchmark PCMark 7 to measure the general system performance of our review device. 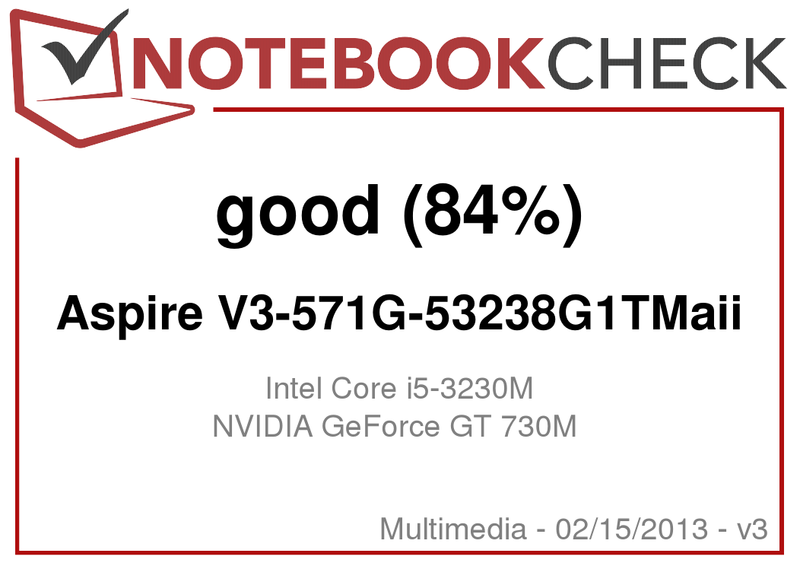 With 2532 points, the Acer Aspire V3-571G came out with a solid, though not phenomenal result, around the same level as its predecessor model Aspire V3-571G-73614G50Makk. While the Intel Core i5-3230M and the Nvidia GeForce GT 730M set up for a high system speed, the somewhat dusty 5400 rpm HDD slows down the overall performance. If you contrast SSD-run devices like the Asus UX51VZ and ours, you see clear speed differences (even if they're built with a quad-core CPU), and these differences express themselves in the PCMark 7 overall score (5454 points). 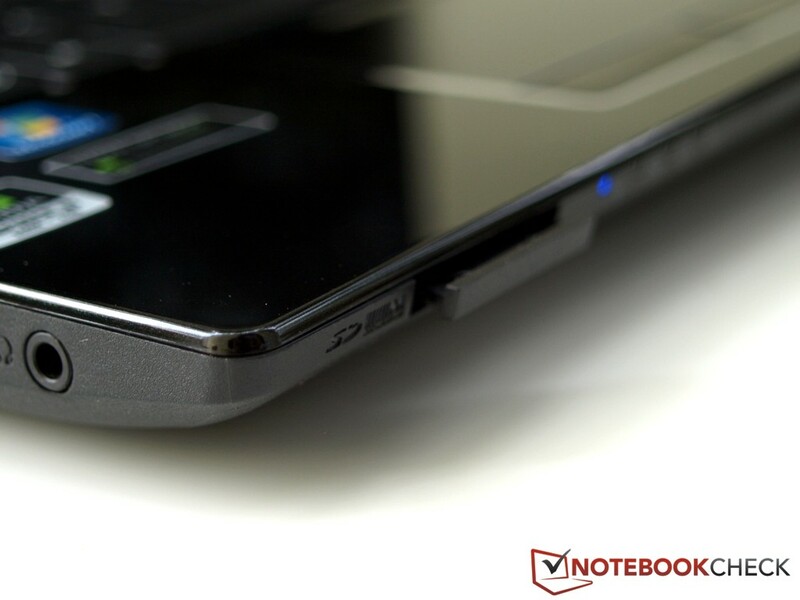 For everyday use the Acer Aspire V3-571G runs fluidly without any limitations, though the lack of SSD or at least the missing SSD cache is noticeable when you directly compare boot times or the time necessary to start programs. As mentioned under the point system performance, a conventional HDD from the manufacturer Seagate putters in the Acer Aspire V3-571G-53238G1TMaii. The abundant storage capacity of 1000 GB offers tons of space for games, movies, music and other files. But this isn't quite enough to totally cover over the fact that the mechanical drive, with its 5400 rpm, is an aged representative of the non-volatile storage components. 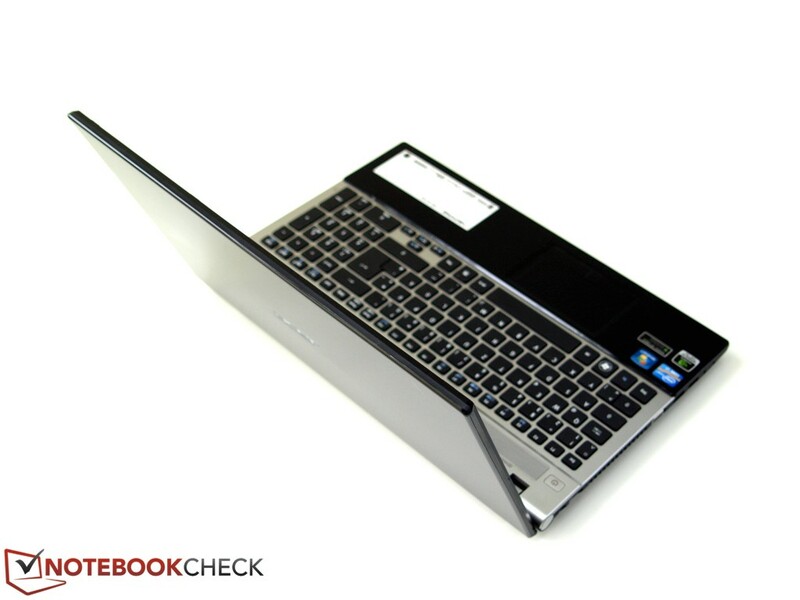 Somewhat leisurely boot times as well as read and write speeds bottleneck the multimedia notebook's system performance and can no longer draw in buyers in 2013. We would have liked to see at least an inexpensive hybrid solution of HDD with SSD cache. Next to the new Full HD display, the graphics card in the form of the Nvidia GeForce GT 730M constitutes the biggest update in the multimedia fireball, especially given that the dedicated GPU is one of the first representatives from the manufacturer's brand new 700 series. The newcomer isn't quite so new as the label would make you suppose, since it's based on the still current Kepler architecture from the 600 generation, which means it turns out to be "just" a renamed GeForce GT 640M and/or GT 645M. 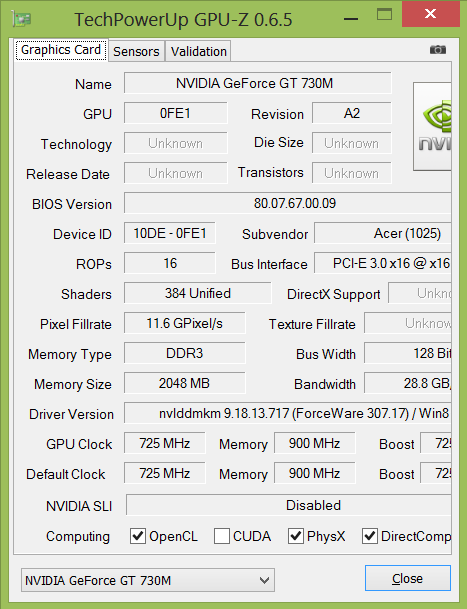 You can find more information in our extensive graphics card database. The GT 730M's "true core" is also apparent when you take a look at the results from various benchmarks, which all lie around the same level as the GT 640M and GT 645M. Besides the new model name, sadly the GPU doesn't provide any boost in performance over the predecessor Aspire V3-571G-73614G50Makk. Benchmarks are all well and good, but of course we're also interested in the actual gaming performance, which we scrutinized at length using a series of current PC games. But there weren't any big surprises -- as expected, the performance remained on the same level as the GT 640M/645M. While the Nvidia GeForce GT 730M and Intel Core i5-3230M team fluidly represent most games in 1366x766 pixels and high detail, hardware-hungry titles like Hitman: Absolution or Far Cry 3 reach their limit at mid-settings. At its native resolution of 1920x1080 pixels and maximum detail the notebook can only manage less demanding or older games, like FIFA 13 or Dishonored. All in all the Acer Aspire V3-571-53238G1TMaii proves itself to be perfectly capable of running games and a good choice for the occasional gamer. 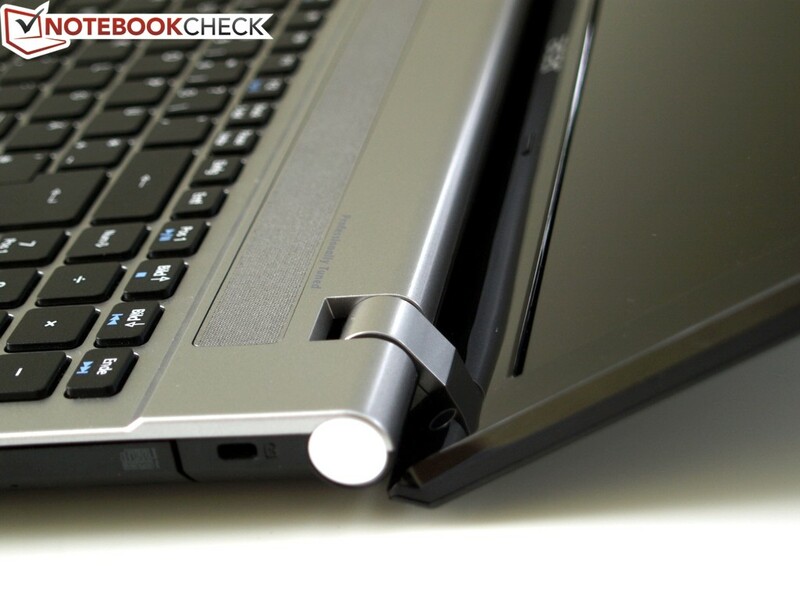 The Acer Aspire V3-571G-53238G1TMaii's case fans leave a conflicting impression. 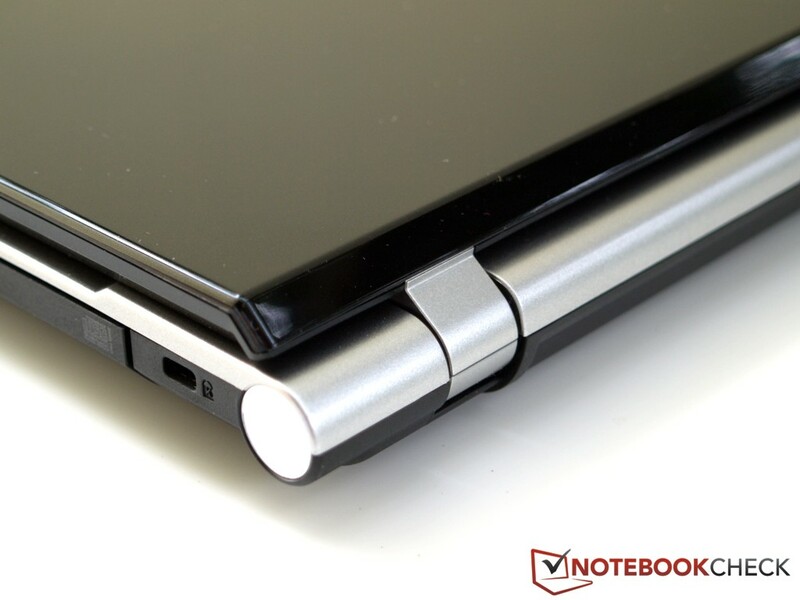 Though the fans are relatively quiet under load when compared with other devices (even under full load (stress test) the user hears a clearly audible whir, but compared with other notebooks a reasonably soft one), the device's behavior in idle mode is less pleasing. 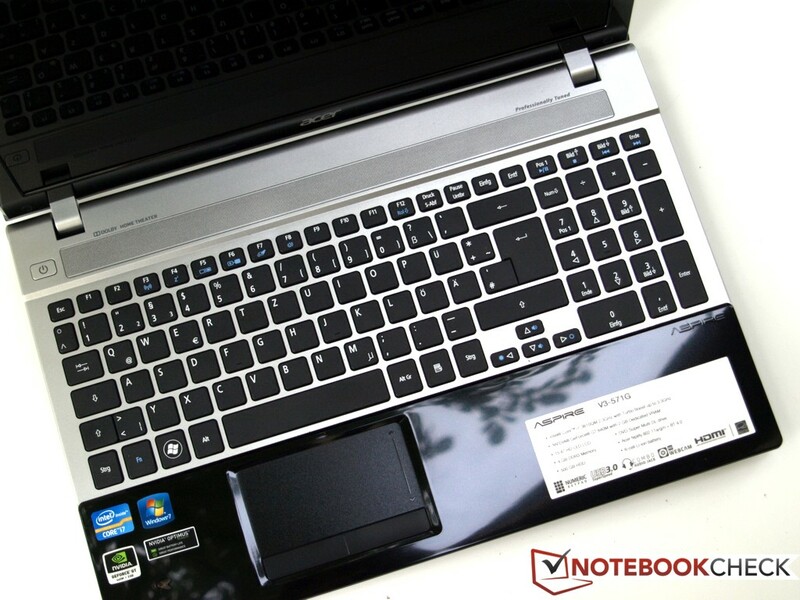 Under a low level of load the multimedia notebook runs at an acceptable, quiet level of noise. But the operation can't be classified as "whisper quiet," since the fans run at their lowest setting almost uninterrupted. According to our measurements this doesn't constitute a bothersome level of noise emission. The Acer Aspire V3-571G confidently marches into the category of "temperature" and is especially pleasing in idle mode, due to its low surface temperatures. The average measured temperature of about 29° C (84° F) is far beyond the reach of any criticism. Under high levels of load the case temperatures rise considerably, but subjectively the base unit never becomes terribly warm. The fan output on the left side could become uncomfortable for lefties during extended gaming sessions, though at a distance of just a few centimeters the unpleasant heat generation is no longer an issue. 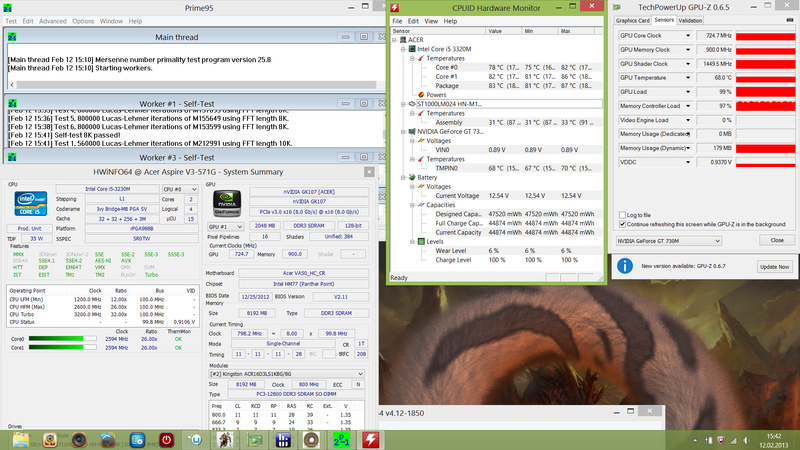 The hardware temperatures are also in a good and absolutely harmless range. In our one hour "stress test" (Prime 95 and Furmark) for the purpose of loading the CPU and GPU to 99%, we measured the CPU at an average of 84° C (183° F) and the graphics card at 68° C (154° F). Here, the Nvidia GPU ran continuously at its full clocking rate of 725 MHz (core) and 900 MHz (memory), while within just a few minutes the Intel Core i5-3230M fell from its 3 GHz (Turbo Boost) to its base clock of 2.6 GHz, though it held to this number without throttling. 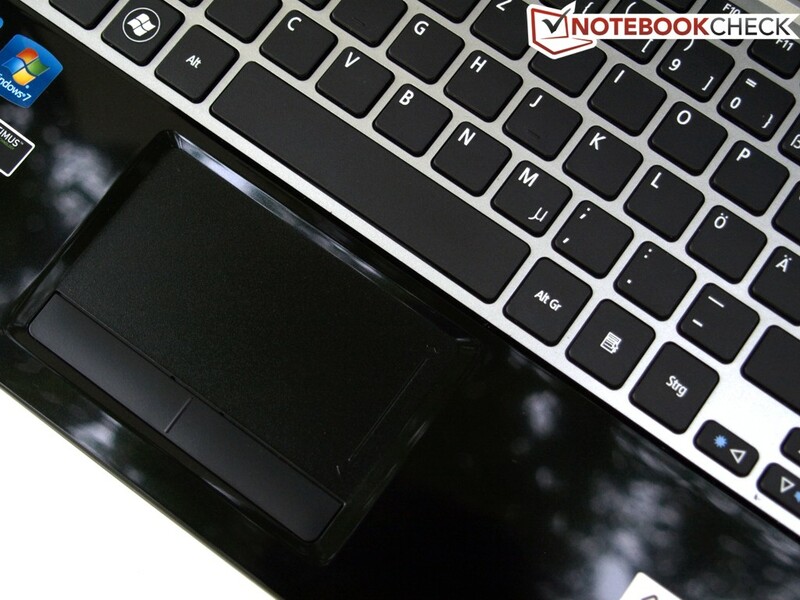 (-) The average temperature of the palmrest area of similar devices was 29.1 °C / 84.4 F (-8.9 °C / -16 F). 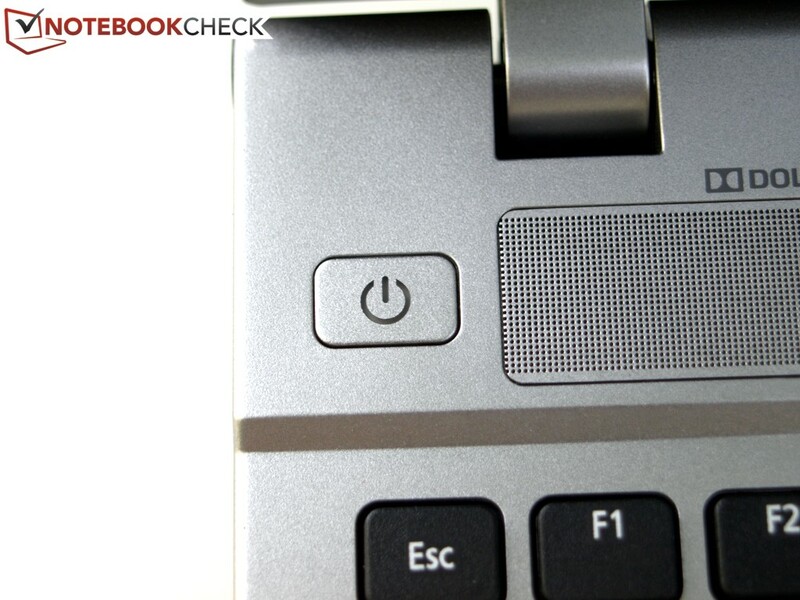 The Acer multimedia notebook doesn't do very well when it comes to the speakers. "Dolby Home Theater" sounds good in writing, but in practice there isn't much there. The rather thin and tinny sound without strong bass certainly won't be very satisfying to users with high demands or who have been spoiled by high-quality speakers. They're alright for the price class, but the sound experience won't create a great atmosphere. However, for simple internet calls and modest demands, the Aspire V3-571G's speakers are sufficient. 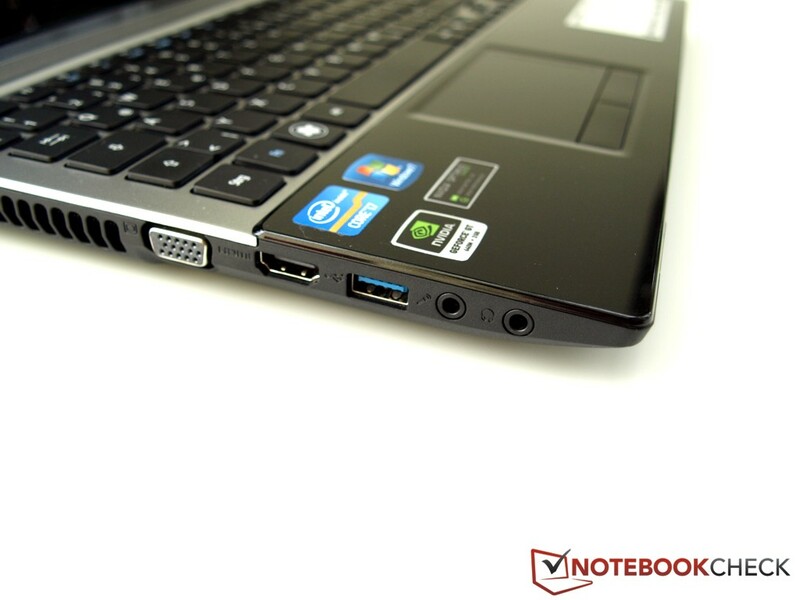 The 15-incher's power consumption is right with its class compared to other multimedia notebooks. The high-performance components consume a perfectly acceptable 75 W under load. In idle mode and under low levels of load Nvidia's Optimus technology deactivates the dedicated GPU and leaves the job to the energy-saving Intel graphics card. As such, depending on display brightness and the energy saving profile, the device consumes a normal value of between 8.6 and 13 watts. At 48 Wh the battery, though not exactly liberally furnished, proves to be sufficient, though it can't dream of reaching run times anything like those of ultrabooks or MacBooks. 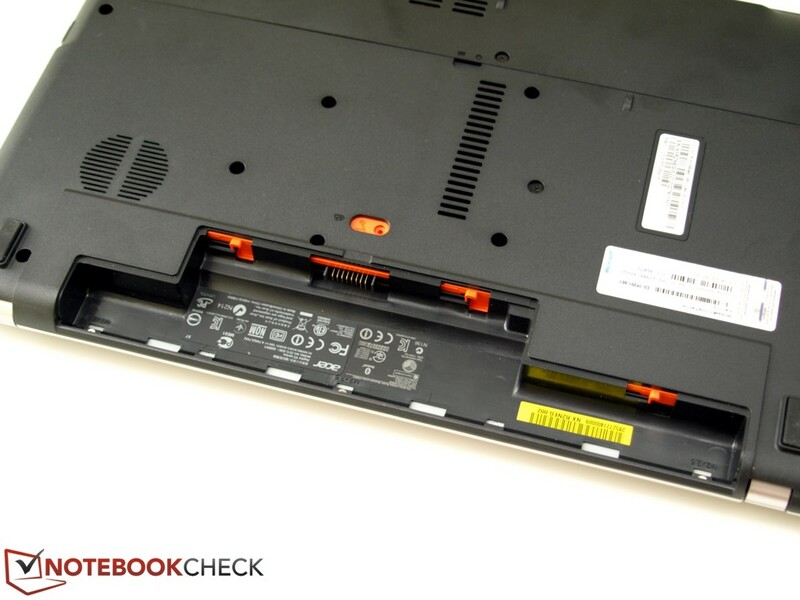 The Acer Aspire V3-571G-53238G1TMaii's battery life isn't one of the multimedia notebook's greatest qualities. Acer claims their model possesses a maximum run time of a mediocre 4.5 hours, which definitely doesn't promise outstanding results in our battery life tests. Unfortunately, our maximum battery runtime measurement can neither affirm nor dispute this value. Despite efforts to force the computer to use the integrated Intel HD 4000 rather than the Nvidia component, our measuring program "Battery Eater" continually activated the Nvidia GPU, which means we couldn't determine an authentic maximum runtime. 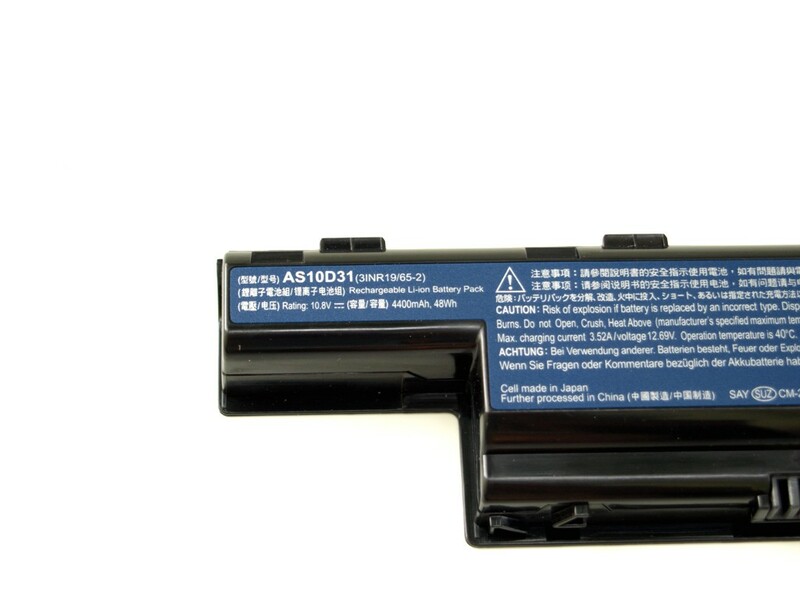 Our WLAN test (~150 cd/m2, energy-saving mode) can strengthen the case for the manufacturer's specified maximum battery runtime, having reached 3.5 hours. But it demonstrates a no more than average endurance of the 48 Wh battery, which is confirmed by the mediocre run time of 2 hours and 16 minutes in the DVD test. Under load and when using the dedicated graphics card the device becomes more power-hungry, and the endurance of the multimedia device away from the wall socket is significantly reduced. With their Aspire V3-571G, Acer undoubtedly brings an attractive device to the market. 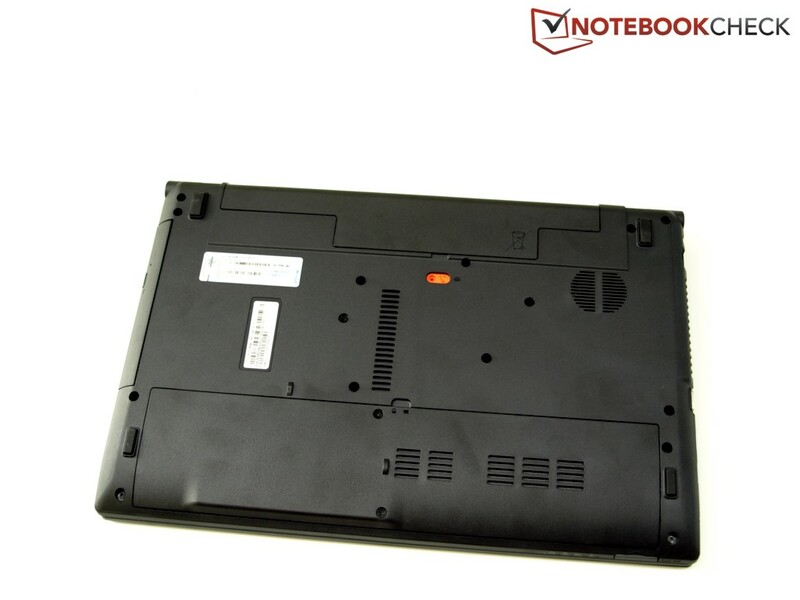 The multimedia notebook's outstanding main feature is its good Full HD display, which is currently matchless and exactly the right response to the still numerous "0815" glossy panels. With a crisp resolution of 1920x1080 pixels, very good contrast and brightness values and excellent viewing angle stability (thanks to the IPS technology), compared with the similarly priced competition the Acer Aspire V3-571G-53238G1TMaii's display plays in a wholly different league. The second update, the new Nvidia GeForce GT 730M, turns out to be a high-performance graphics card that is good for casual gamers, but the only truly new thing about it is its name. Since the new GPU is just a renamed Kepler chip from the market leader, the differences between the new computer and the predecessor Aspire V3-571G-73614G50Makk with its GT 640M are slight, rendering its benefits insignificant. We certainly would like to have seen an increase in graphics performance for this follow-up model. Acer is also offering their Aspire V3-571G-53214G50Maii with a GT 640M and FHD IPS. 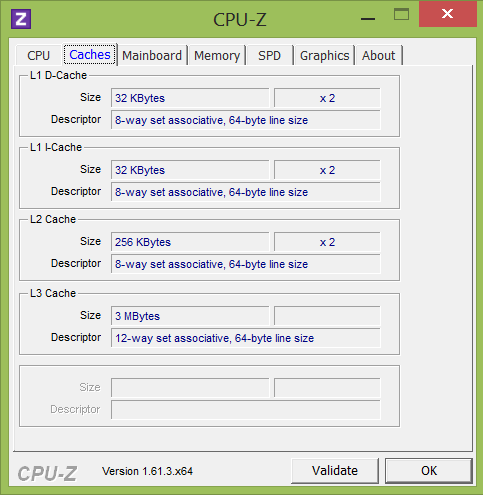 The user has to accept small performance deficits when it comes to the CPU. In contrast with the predecessor model we reviewed with an i7-3610QM quad-core, our updated device is "only" furnished with an i5-3230M dual-core processor. 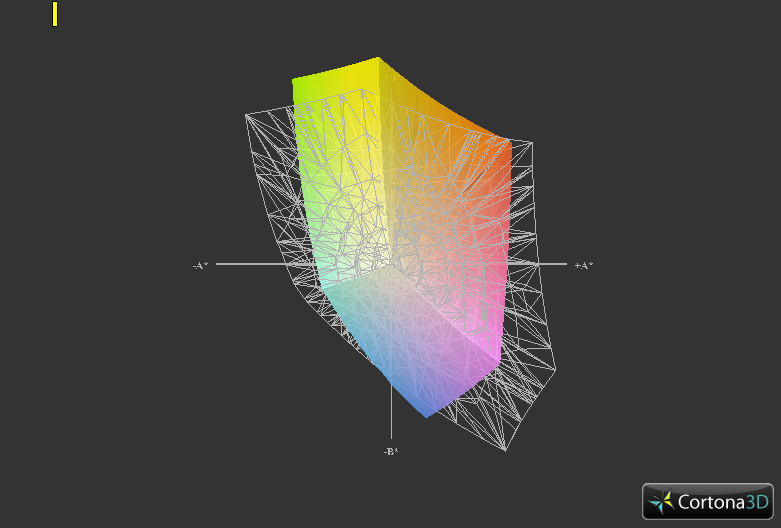 But this processor is more than sufficient for almost any task and is only disadvantageous in renderings. We don't yet know whether our model with the FHD IPS screen will be offered with a quad-core CPU as well. In the remaining categories our review device, with the same parts and components as its sister models in the 571G series, acts very similarly to its predecessors. The device isn't going to receive any crowns here, but it's on par with its class in its price range. The bottom line is that Acer's update can be summarized as a success, since the multimedia device's already potent computing performance has (finally) been combined with a distinctly high-quality display. With that the manufacturer positions the new Aspire V3-571G-51238G1TMaii in a field without a single competitor (for the moment). 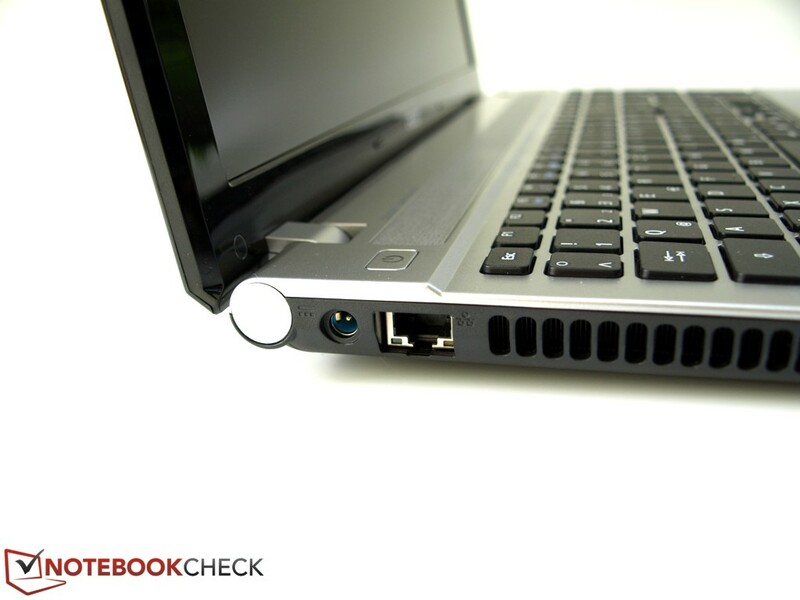 With a click of the power button we breathe life into the Acer Aspire V3-571G. ...while the fans blow out the warm air from the back left side of the case. 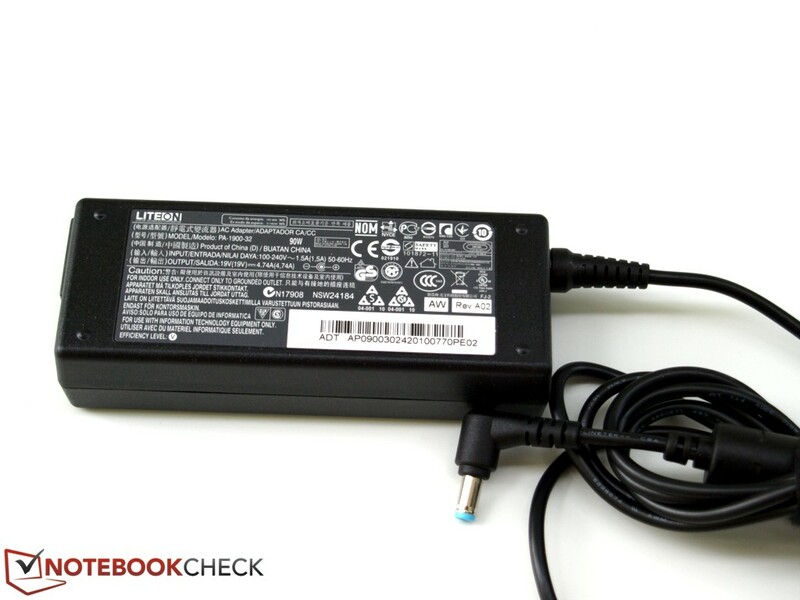 ...status LEDs, which inform the user about the operating status of the notebook. 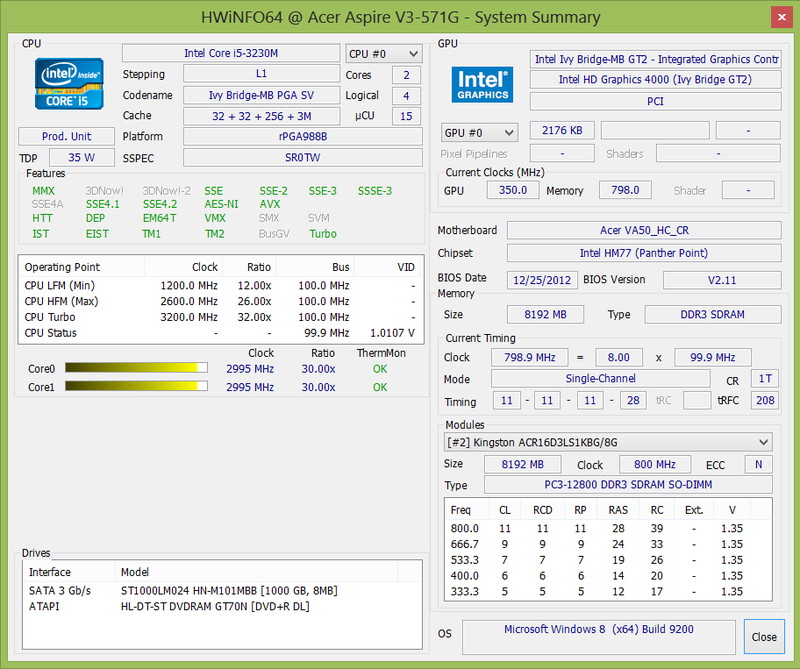 ...unfortunately its capacity of 48 Wh isn't enough for much more than mediocre runtimes. The writing over the speakers promises good quality sound. 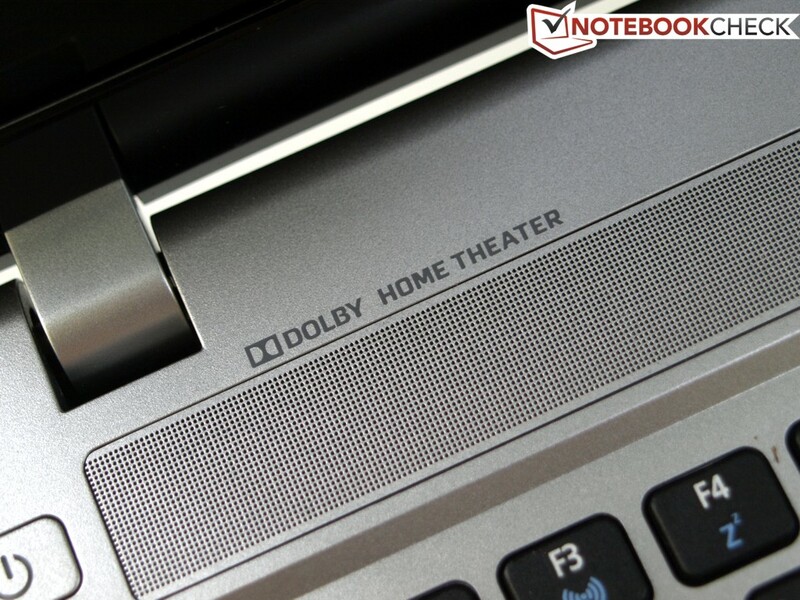 But we would like to have seen a somewhat more robust sound from "Dolby Home Theater". The keyboard has a complete number block. 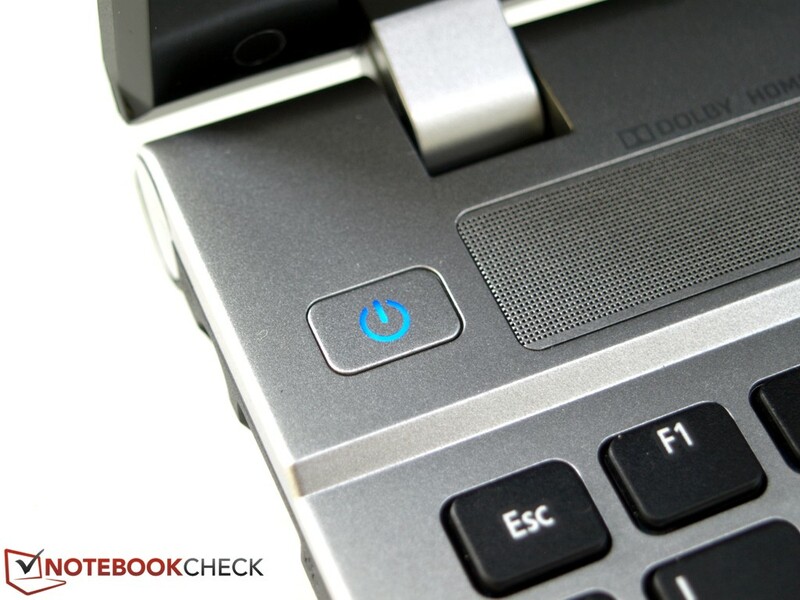 The power button acknowledges this with a bright blue glow. 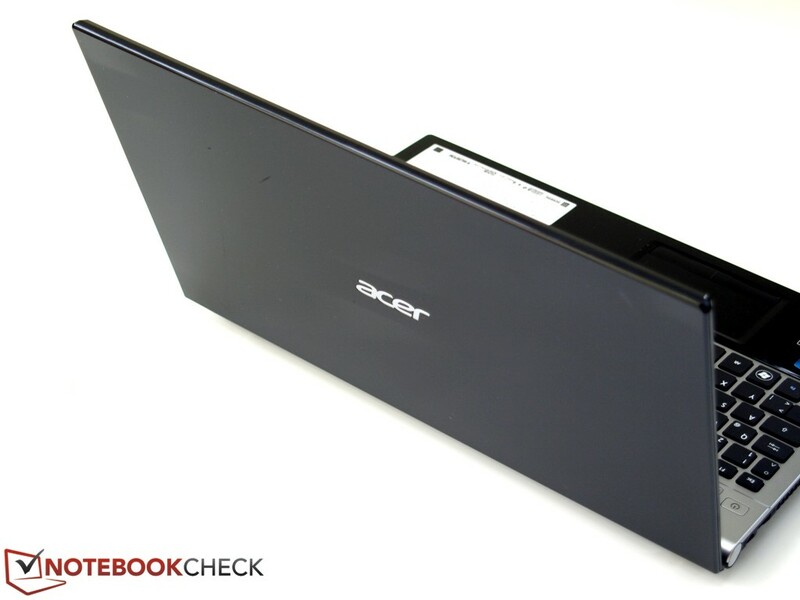 In terms of design, Acer delivers an attractive notebook. But the shiny plastic surfaces are susceptible to the collection of dust and fingerprints. ...the display...*drum roll please*...is MATTE! ...and the keyboard (photo from the structurally identical predecessor model). The high-quality IPS display with Full HD resolution and good picture quality in an 800 Euros (~$1045) multimedia notebook is nowhere else to be found. We certainly would like to see somewhat better speakers on a multimedia device with a focus on games, music and movies. 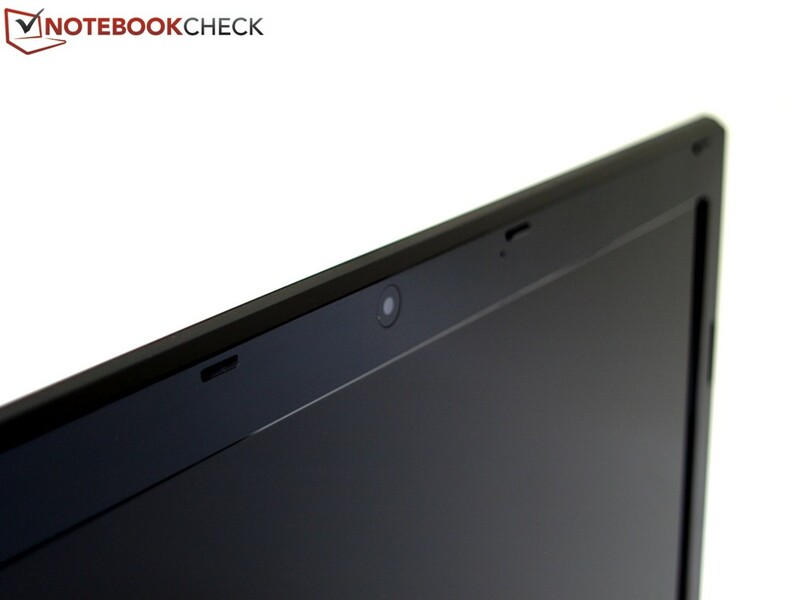 That even with high-performance components, Acer added a high-quality IPS panel without a price increase. Sony Vaio VPC-F24M1E/B (i5, GT 540M, matte) for sale; MSI GE60-i560M245 (i5, GTX 660M, matte); MSI GE60-i547W7H (i5, GT 650M, matte); Lenovo IdeaPad Y580 (i5, GTX 660M, glare); Lenovo IdeaPad Y500 (i5, GT 650M, glare); Medion Akoya P6815 (i7, GT 650M, matte); Dell Inspiron 15R SE (i7, HD 7730M, matte).